I recently watched a movie called The Curious Case of Benjamin Button which some of you may have seen. In this film the lead role, played by Brad Pitt, is born as a decrepit old man and gets steadily younger until he eventually died of old age as a baby. To say that it’s ridiculous is the understatement of the millennium. Yet many people come away from watching this film thinking “How wonderful, if we all kept getting younger!” As a contrarian I instead found myself wondering about the catastrophic effect on the cosmetics industry, as the market for anti-aging creams would collapse. 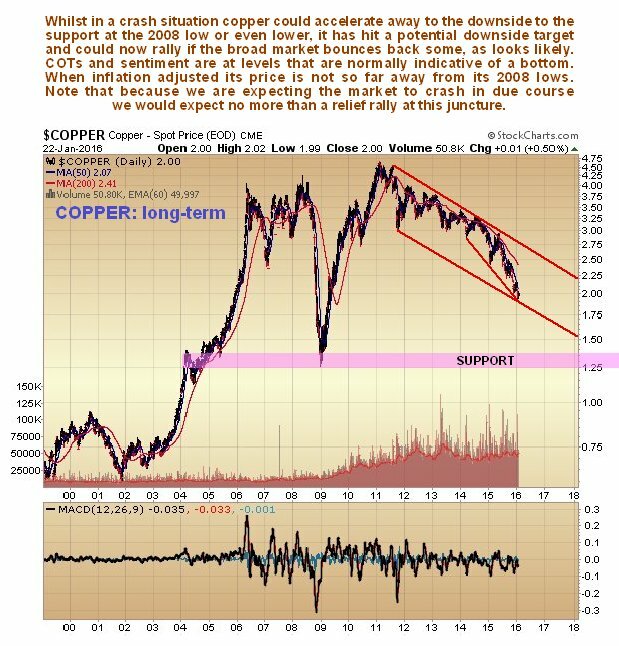 I mention this because it was the inspiration for the title of this article, because at first glance it looks like the copper price is going to drop through the floor, yet on closer inspection there is evidence to suggest that it is instead going to stage a significant recovery rally, which supports our contention that there will now be some sort of recovery rally in the broad stockmarket. 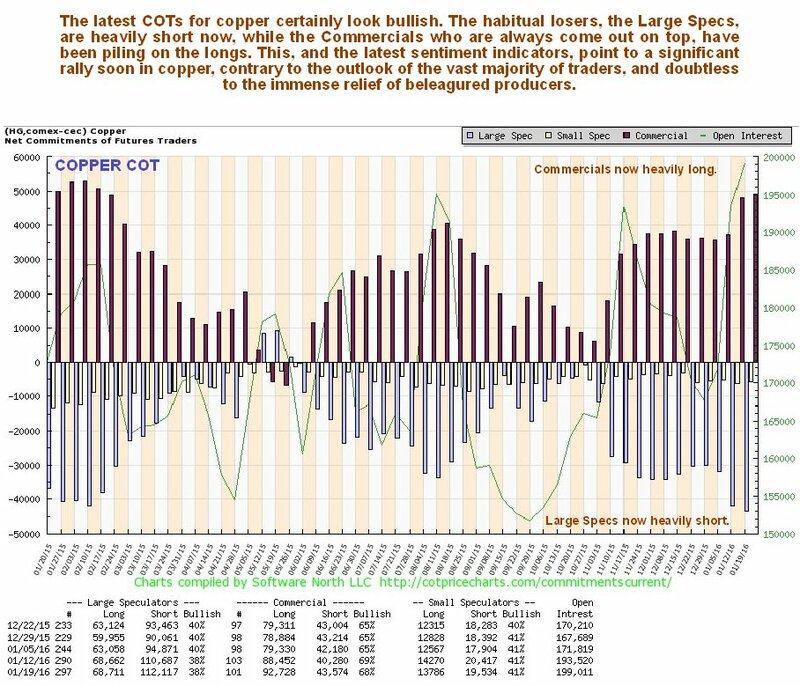 When you look initially at the long-term chart for copper, it appears to be set to plummet to its 2008 crash lows at $1.25, and possibly even lower, but then when you look more closely at it, bearing in mind that its latest COTs look bullish, and sentiment towards it is in the basement, which is normally also bullish, it can be seen that is has arrived at the lower boundary of a potential major downtrend channel. It has actually gotten to this point in a relatively measured manner, without an all-out panic, which is why it is not more oversold on its MACD indicator. 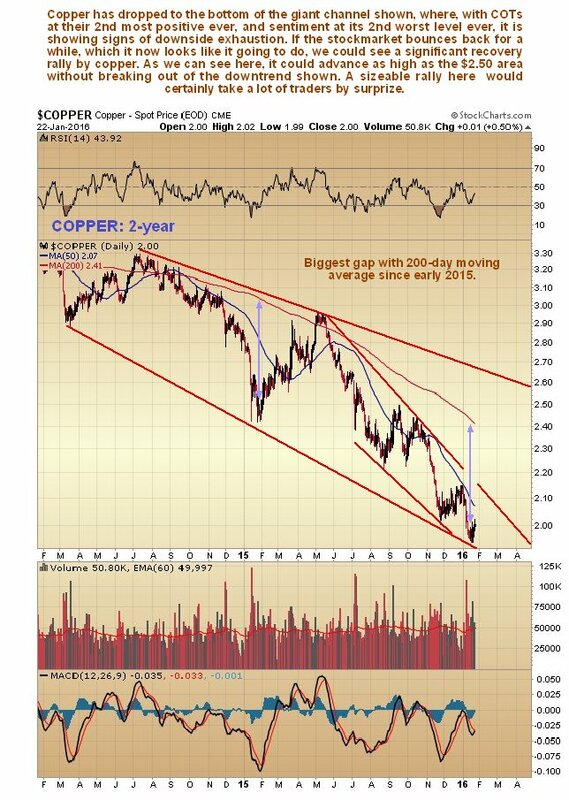 As well as dropping to the bottom of the giant channel shown on its long-term chart, copper has also arrived at the bottom of the expanding channel shown on its 2-year chart, within a steeper sub-channel in force from last May. On this chart it is clear that it could rally all the way back up to the upper boundary of the expanding channel, which would take it to about $2.50 - $2.60, and still be within its bearmarket downtrend. On this chart we can also see that it has opened up a big gap with its 200-day moving average, as it had exactly a year ago, which lead to a sizeable rally. The same could happen now. Other factors that increase the chances of an intermediate recovery rally include the latest COTs, which show that the Commercials have built up a big long position. They are normally right, while the Large Specs, who are habitually wrong, probably because they believe what they read in the papers, have built up a big short position. 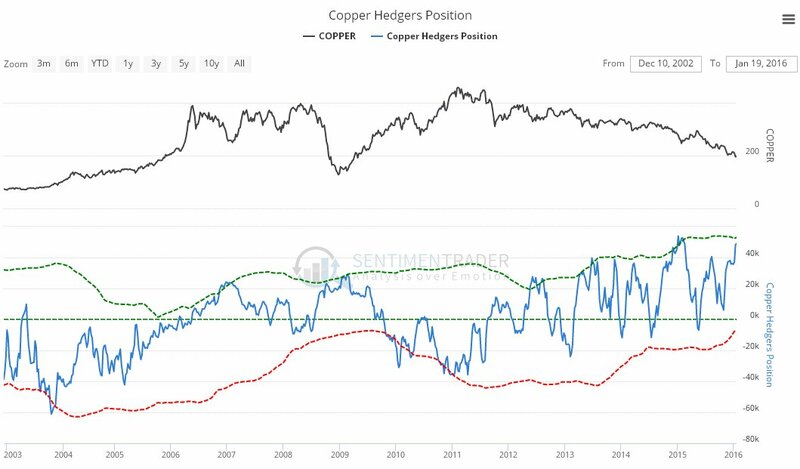 The Hedgers chart, which is another form of COT chart, is also interesting to see here, because it shows the 2nd most bullish position setup since at least 2003. 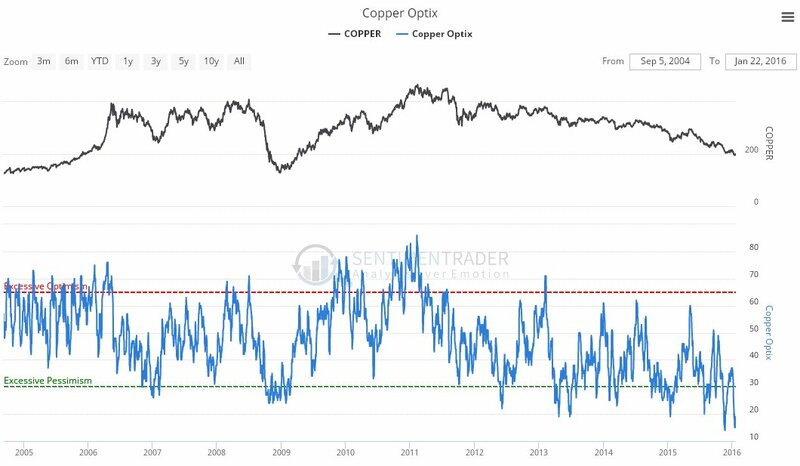 Sentiment towards copper is in the basement, as you would expect, with the 2nd most negative reading also since about 2003, as we can see on the copper optix, or optimism chart. This too suggests a rally. 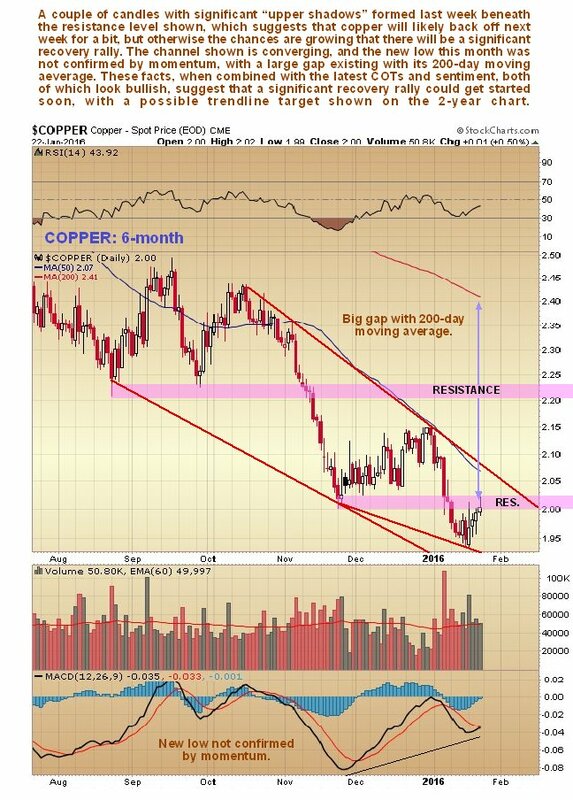 Finally, the 6-month chart shows that copper staged a minor recovery rally late last week to arrive at a resistance level beneath which a couple of candles with longish “upper shadows” formed, suggesting that it may back off a little early next week. Apart from that though, the other factors that we have looked at point to an intermediate rally developing. On this chart we can also see that the recent new low was not confirmed by momentum, which is another positive sign. “Alright, so what?”, I here you ask – “There are few ways to play a move in copper profitably, so what use is this to me?” In the first place there is a big copper stock that is terribly beaten down and looks like it is set to recover, that we will have a look at on the site very soon. Because it is so terribly cheap, this stock could make a big percentage gain quickly, and fairly close stops can be set. Secondly, what we are seeing here has major implications for world markets at large, since if copper rallies it is most likely to do so against a background of recovering world markets, and that also means that oil is likely to recover as well, glut or not. Posted at 3.00 pm EST on 24th January 16.